At JAKE'S, you will not find pre-made frozen food on the menu. Our signature burgers are hand-pattied, cooked to order and never frozen. To finish off their meal, guests enjoy a variety of our famous hand-dipped milkshakes – a customer favorite. Additional menu items include hot dogs, a variety of sandwiches, chicken fingers, fresh salads, along with one of our most popular specialties, fresh house-made potato chips. Franchising since 2002, and currently with over 30 locations in operation, JAKE'S Hamburgers franchise is now gearing up for aggressive growth. We are currently awarding franchises nationwide. Be a part of a concept that has been a tradition in Delaware for 19 years. In addition to your restaurant business, JAKE'S Hamburger franchise offers you multiple income opportunities through delivery, catering, and fundraisers. Imagine YOUR JAKE'S franchise being the talk of your town's next major community event! JAKE'S is the perfect menu choice for company functions, birthday parties, charity events, and more! We encourage qualified franchise owners to open multiple locations through our Area Developer Program. Based on your application and financial information, you may be eligible to purchase more than one JAKE'S franchise up front and at a discounted rate. Alternatively, you may want to purchase a franchise, become familiar with the business, and then purchase your second or third JAKE'S burger franchise. For Single Unit franchises, the initial franchise fee is just $35,000 for a twenty (20) year term. The on-going royalties are a low 5% of gross sales and your National advertising fee is 2% of gross sales. For Area Development franchises (3 location max), the initial franchise fee is $75,000 (3 restaurants) each with a twenty (20) year term. The on-going royalties are a low 5% of gross sales and your National advertising fee is 2% of sales. will be in constant contact with your designated JAKE'S representative. Your training will include a five day course at Jake's University located at our headquarters in Cheshire, CT, as well as an additional fourteen days of in-store training. Together you will work through a checklist from the time you sign your franchise agreement to the time you open your doors to your first customers. Rest assured that when you become part of the JAKE'S family, you will never be alone. A well established burger franchise brand (19 years) with a loyal following, JAKE'S allows you to be in business for yourself but not by yourself. 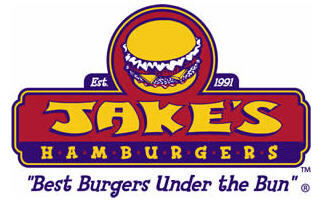 JAKE'S hamburger franchise can help you realize financial freedom through a fun business ownership opportunity. I am Interested: What Happens Next? JAKE'S is growing! If you are ready to take control and build equity in yourself instead of someone else, complete the request form below. We will contact you within 72 hours to answer all of your questions and get you excited about owning your own JAKE'S Hamburger franchise. CT, DC, DE, FL, GA, MA, MI, MD, NC, NJ, NY, OH, PA, SC and VA. Interested parties should have at least $70,000 liquid capital to invest.